If not for the fact that I had made my booking on Friday night about 2 months in advance I think I would have tried to reschedule. The weather on Friday night was more than a little average. The rain was in fact torrential when GG and I arrived at the car park near Perth train station. From there we managed to duck and weave our way through the shops and arcades before we had to brave crossing William Street. This small run from the corner of William and Hay to The Quarter which is just at the back of the church on the corner proved quite difficult and we were both sporting the ‘drowned rat’ look by the time we arrived. Such is life at times I suppose. Our table was waiting for us though and we were promptly brought a glass of water and it was explained that with our Scoopon voucher we would be starting with a tasting plate, we could then choose any mains and dessert off the menu and also had the option of either a glass of red or white wine. 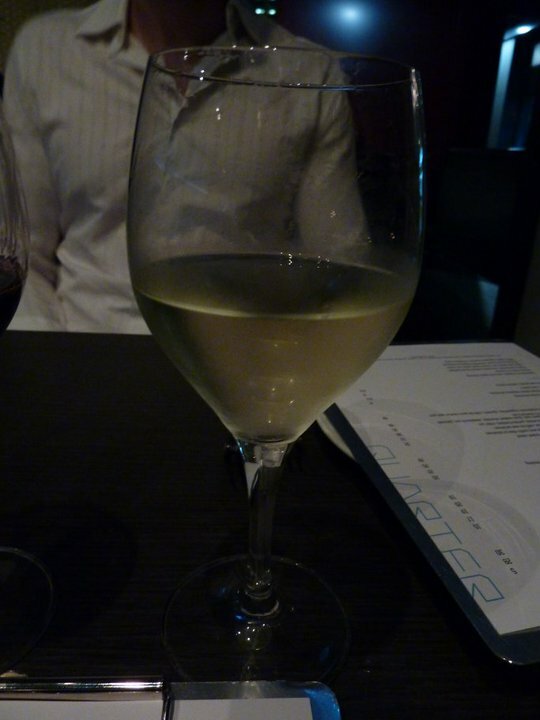 As per usual, I went the white and GG went the red and it was a decent drop…. Tall Boy I believe it was called. So anyways the restaurant was reasonably busy and the set up inside is a bit different. The front it open and its sort of like it is positioned in the lobby of a high rise building. This does mean that acoustically it is quite loud, didn’t really bother me too much though. Didn’t feel like I was shouting across the table or anything like that. 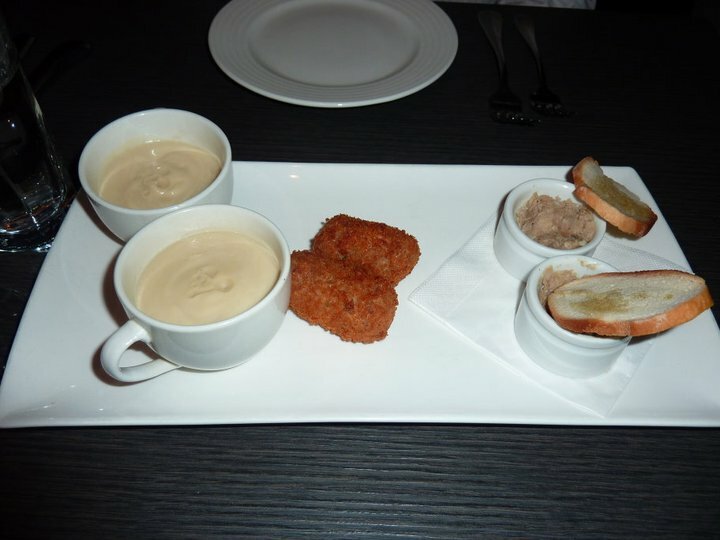 So the tasting plate didn’t take too long to arrive and it consisted of cauliflower soup, a croquette of black pudding and chorizo and then a slice of baguette with a small dish with a mix of pork belly and apple. The soup was amazing and suited the weather to a tee! Warm and creamy I could have happily eaten a whole bowl of it, but settled on this occasion for the dainty tea cup full that we were given. The croquette was interesting, had almost a smokey flavour and the pork belly creation was also pretty tasty, perhaps just one or two more slices of bread would have been nice. Just so that the ratio of pork belly to bread was a little more even. A good tasting plate though – thoroughly enjoyed. 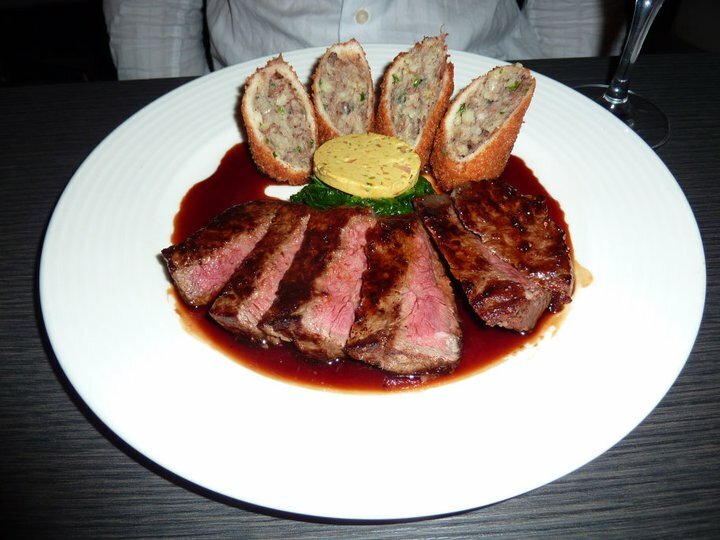 Then onto mains, GG went with the Black Angus sirloin, oxtail & mushroom croquettes, spinach, cafe de paris butter, port jus ($42)… hard for him to go past a steak on most outings. I was lucky enough to sample a bite and it was delicious. The butter on top added some incredible flavour to what was perfectly cooked medium rare meat. The croquettes were also a tasty treat and nice and crunchy, was good contrast. Having heard good things about the lamb dish from others I decided that I would give this one a go. 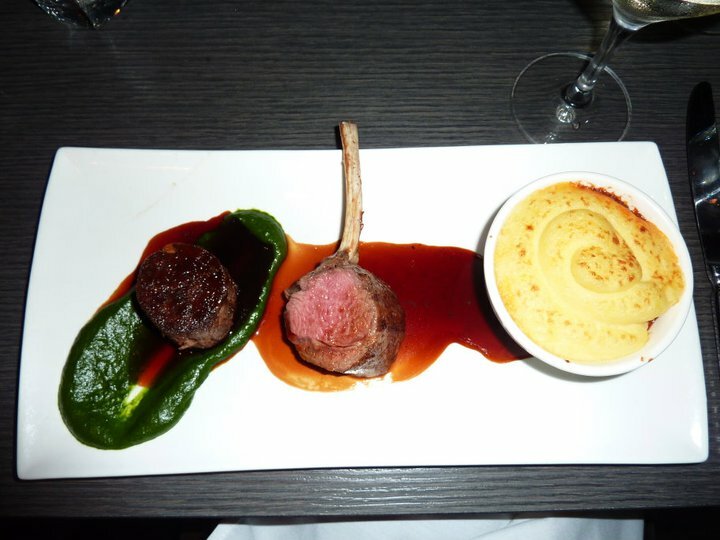 Lamb assiette (lamb three ways): lamb rack, slow cooked shoulder, sheperds pie, spinach purée, roasted garlic, white wine & rosemary jus ($39). I worked left to right on the plate. So I started with the slow roasted lamb shoulder on its colourful green swirl of spinach. It just melted in your mouth. While reluctant to share this tasty morsel I returned the favour to GG, who agreed it was top notch. 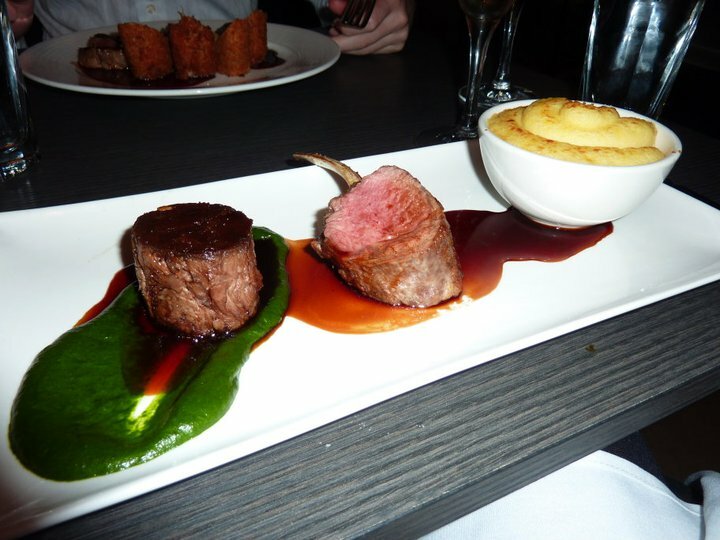 Next up was the lamb cutlet, wonderful pink and tender, it was some kind of wonderful. Then the final addition to the lamb trio was a Sheppard’s pie. This was the only real disappointment to my meal. It was just fairly bland, like the minced lamb needed a bit more zap to get it over the line. But hey like Meatloaf said, “two outta three aint bad” – so in all a decent meal, just maybe start with the pie so you end on a higher note. Finally it was time to peruse the dessert menu. 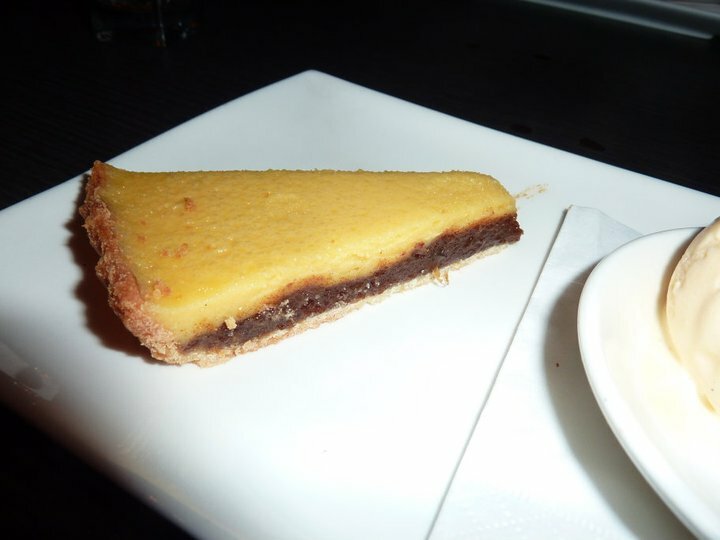 The one thing that disappointed up both a little, given the weather, was that there wasn’t a warm option available – apple pie, sticky date, just something you know… So GG went with the Baileys crème brulee, chocolate dipped shortbread ($13) and I gave the Date & vanilla tart, house made vanilla ice cream ($14) a go. They were both just ok really. Nothing too special about either of them. 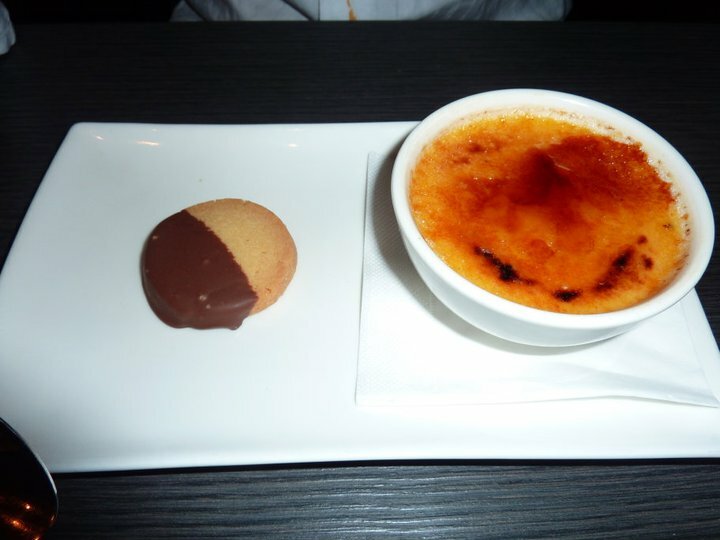 I think GG’s comment to me that the favourite thing about his dessert was the shortbread biscuit on the side which perhaps says something about the brulee. It was fine but not the best ever. 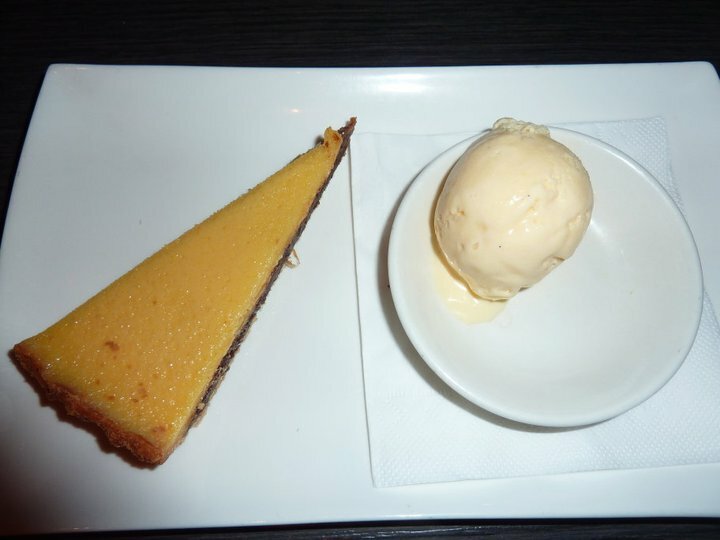 And similarly for me I was probably more enthused by the homemade ice-cream than the tart, which sort of reminded me of one of those old school Arnott’s pillow biscuits. Having said that though, I loved pillow biscuits, still do, just haven’t had one in forever, but I digress. They probably lost us a little on dessert since we had both been chasing something to combat the cold weather. In all The Quarter is a decent spot for a meal. Quite an interesting menu in parts and good, friendly service with trendy décor. If I was late night shopping in the city on a Friday I’d give it another go.